Keith Booker, making his fourth visit to Stumperlowe, brought with him greet­ings from his home club of Dore, and explained that his latest selec­tion of pho­to­graphs from around the world was put together by request after he gave us Part One just over two years ago. The cynics amongst us per­haps thought we were in for a slideshow of hol­i­day snaps, but this was a travelogue with a dif­fer­ence. Jules Verne’s Around the World in Eighty Days has noth­ing on Keith Booker’s Around the World in Fifty Minutes. The open­ing theme was the Ancient World, and we star­ted off in the city of Petra, in Jordan. 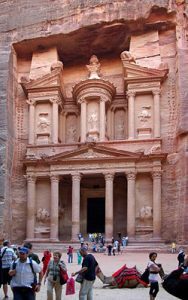 At its peak Petra – which trans­lates as ‘rock’ — was home to 20,000 people who, in the midst of the desert, built an ingeni­ous system of water­ways and a huge amphi­theatre. Next stop was the Great Pyramid of Giza, which at 480 feet was the tallest man­made struc­ture in the world for nearly 4,000 years, con­struc­ted out of 2.3 mil­lion stone blocks. The Great Sphinx of Giza, which meas­ures 238 feet from head to tail, is estim­ated to have been built earlier than 2500 BC. Time to move on, and the ancient Greek city of Ephesus (now actu­ally in modern day Turkey) was one of the Seven Wonders of the Ancient World. Olympia, site of the ori­ginal Olympic Games, The Temple of Posiedon, near Athens, and Old Corinth, famous as a trad­ing centre, were next on the itin­er­ary. Back on the magic carpet, and Rome was our next stop. The Colosseum, built in 72 AD, could seat more than 50,000 spec­tat­ors and it is thought that half a mil­lion people and twice as many anim­als were killed in the man versus beast con­tests. Versuvius looms over both Herculaneum and, more fam­ously, Pompeii, the city which was des­troyed by vol­canic ash in 79 . On now to India. Traditional house­boats can be hired on the Kerala back­wa­ters near Cochin, or Kochi. They are related to the dhow and were ori­gin­ally designed as spice trad­ing ves­sels. Today, spices are mainly trans­por­ted by road, giving the boats a new lease of life as leis­ure ves­sels. We saw sim­ilar scenes in Thailand and Vietnam before ringing the bell for the next stop, Venice, where today there are still 400 gon­dolas ori­gin­ally used to trans­port goods from the mar­kets to the palaces along the canals. North now to Lake Garda, where we saw part of the hull and bow of the Italian naval cruiser Puglia, launched in 1903, installed in a garden high above the lake and bring­ing a new slant to the craze for deck­ing. Across the Atlantic now for a look at the impress­ive bridge of the Queen Mary, which oper­ated between 1936 and 1967 and is now pre­served as a hotel and con­fer­ence centre in the har­bour at Long Beach, California. Its suc­cessor the QE2 was launched in 1969 and retired in 2008, having sailed a greater dis­tance than any other vessel of any type, and Keith cap­tured it in Hong Kong har­bour for his photo col­lec­tion. In an instant, Keith then whisked us off to Scandinavia for the QE2’s last visit to Norway and her appear­ance at an annual steam­ship fest­ival, which in 2008 was held in Stavanger. Continuing the mari­time theme, the Titanic’s first and (as it tran­spired) only port of call on her ill-fated maiden voyage from Southampton was Cork, in Ireland, where we saw an appro­pri­ate memorial. A number of the Titanic vic­tims have their final rest­ing place at Halifax, Nova Scotia, and Keith was on hand with his camera there, too, to show us the grave­stones laid out in the shape of a ship’s bow. On next to New York, worth a whole show in its own right, and then to Greenland, the largest island in the world but with a pop­u­la­tion of just 56,000. From basalt form­a­tions in Iceland we flew as if by magic to the sim­ilar Giant’s Causeway on the Antrim coast in Northern Ireland, and then headed north via Tromso and its Arctic Cathedral to the North Cape, the most north­erly point in Europe. The old com­mer­cial dis­trict of Quebec has some remark­able murals, giving it a link with Cannes, in the South of France. 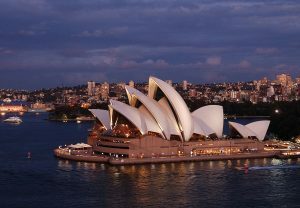 Soon we were back in Ireland, and Dublin in par­tic­u­lar, and the North Yorkshire fish­ing vil­lage of Staithes also had its moment of fame before we jetted off to Australia, and the Sydney Opera House. After a stop-off in Bangkok, it was time to board Japan’s famous bullet train for a dis­tant view of Mount Fuji. Then it was back towards home, call­ing in at Istanbul, the ori­ginal ter­minus the Orient Express. Keeping to the rails, we saw the Blue Train in South Africa and the Panama Express, which runs along­side the canal. We didn’t go to Zywiec, in Poland, so Yalta – scene of the famous post­war powwow between Churchill, Roosevelt and Stalin – was a good place alpha­bet­ic­ally to wind up our magical mys­tery tour. * Keith kindly donated his fee to St Luke’s Hospice. Previous PostMusic Education — Does it Matter? — Mary Heyler — 11th September 2017Next PostParticle Physics — Understanding the Universe’s ‘LEGO Bricks’. — Professor Lee Thompson — 25th September 2017.